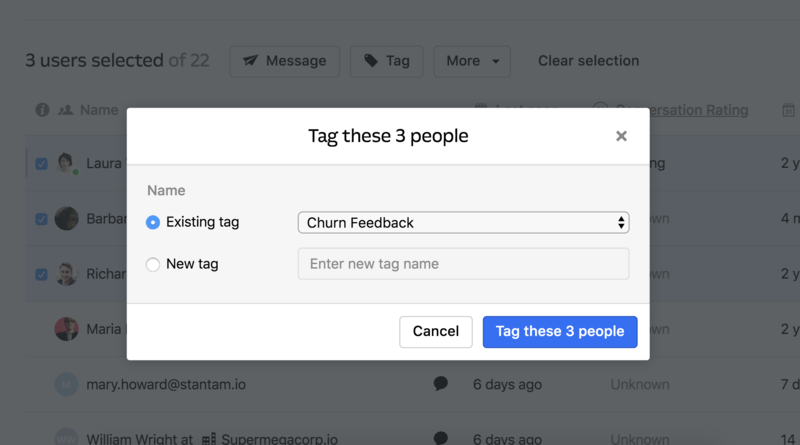 Use tags to better organize your users' activity and behaviour. Tags are similar to segments except that they’re not automated. 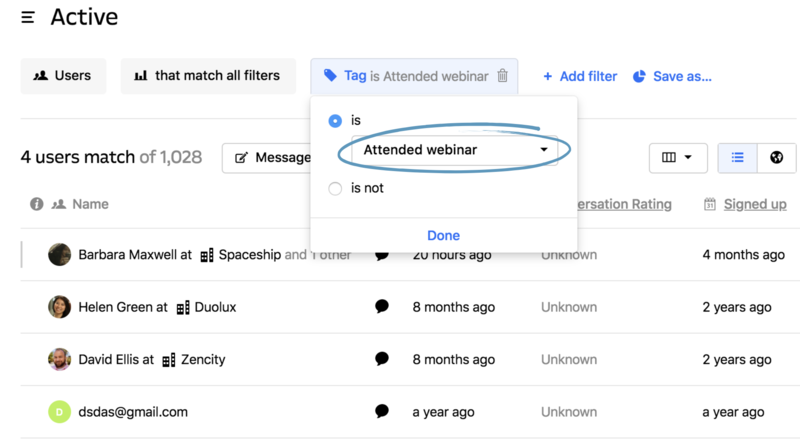 Tags let you group your users (or companies) together, manually. They’re great for highlighting VIP customers who may require VIP support or loyal customers who would make great beta testers, for example. To tag users just select whichever users you like from the user list and click 'Tag.’ Then select the tag from the drop-down menu. Here you can also create a new tag for that group of users. You can see which segments and tags a user belongs to from their profile page. You can also tag users individually here by selecting the 'Add tag' button and choosing the tag from the list. Role in company - You might want to quickly identify the role a user holds in a company. To do so, you can tag any user as an ‘Admin’, ‘Marketer’, ‘Developer’ or ‘CEO’, for example. Bug - If a user finds a bug in your system you can tag them and let all your users with this ‘Bug’ tag know when the issue has been fixed by sending them a manual message. Testimonial - If you have a valuable customer who is particularly happy with your service, you can tag them as a ‘Testimonial’ candidate and follow up with all users with this tag at a later date. (If you want to choose influential candidates, you can check how many Twitter followers your user has in their profile page). Beta Tester - You can also tag all of your users who would make ideal beta testers. You can easily edit a tag by visiting Settings > App settings > People and company tags. Then, just select the pencil icon next to the tag. Or if you don’t need a tag anymore, you can delete it by selecting the x icon. Pro tip: If you’d like to exclude certain users from a segment or message, you can create a ‘Don’t Message’ tag. Then later when creating a segment or auto message, include the filter ‘Tag is not Don’t Message’ to make sure it doesn’t go to that group. 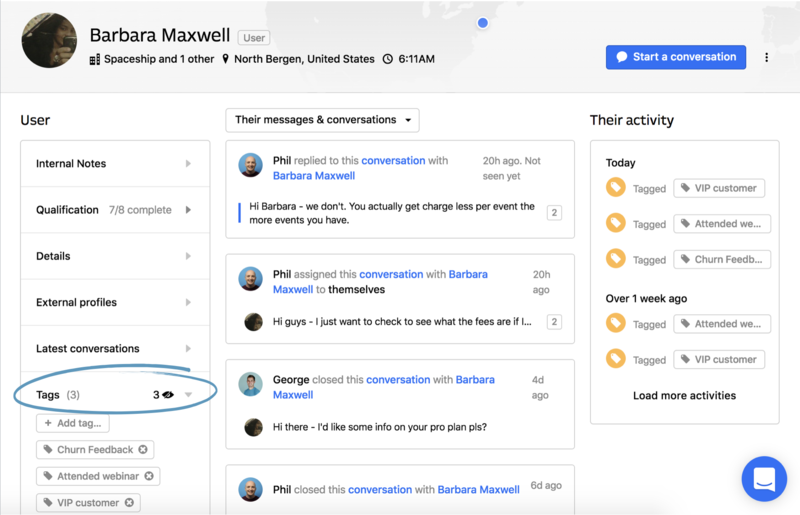 You can also tag your customers’ conversations to help you identify the most important trends in your product feedback. This guide will help you keep track of support requests, bugs and feedback. Note: At the moment you'll need a third party product like Looker to analyze your tags.